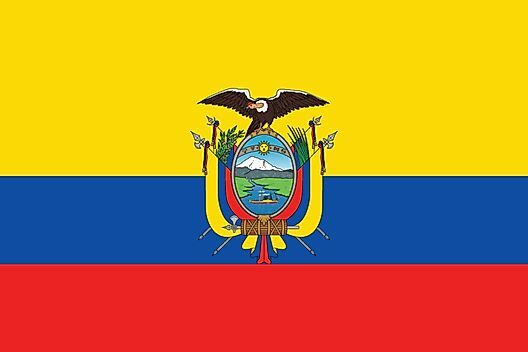 The current flag of Ecuador was officially adopted on September 26, 1860. The red, green and blue are the colors of Francisco de Miranda, the South American revolutionist and adventurer. Yellow is the color of the federation, red is said to indicate courage and blue symbolizes independence from Spain. The centered coat of arms is topped with a condor. The shield is composed of mount Chimborazo, and the Guayas river which symbolize the beauty and wealth of the country. Above the land is a sun surrounded by the astrological signs for Aries, Taurus, Gemini and Cancer. These represent the months of March through July, and symbolizes the duration of the March Revolution of 1845. 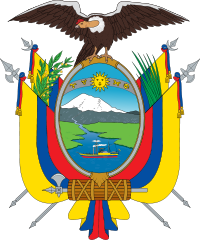 The bird atop the shield is the Andean Condor, and his outstretched wings symbolize the power, greatness and strength of Ecuador. 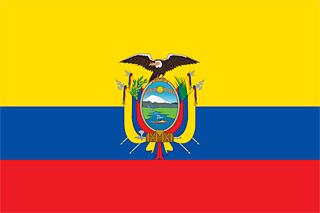 The shield is flanked by the four flags of Ecuador. The laurel on the left represents the victories of the republic, while the palm leaf on the right side is a symbol of the martyrs of the fight for independence and liberty. The Fasces below the shield represents the republican dignity.